This is the 30th year since tertiary health workers formally became members of the Medical and Health Workers’ Union of Nigeria (MHWUN). It is also the 38th year since MHWUN was deemed established by the law, as part of the trade union restructuring exercise of the Murtala Muhammad/Olusegun Obasanjo-led military junta. On one hand, the contents of our history goes deeper and is much richer than these milestones would suggest. On the other hand, a lot has happened since the periods they mark, particularly since the turn of the 21st Century. And quite importantly, we have even much more to do ahead of us. This paper is a summary effort at putting in perspective where we are coming from, with the tertiary health institutions trade group in focus, as a point of departure for discourse on the burning question of “what is to be done?”. Its aim is to contribute to the consolidation of the progress made thus far, towards building MHWUN further, as a strong and dependable union of, for and by health workers. Permit me to point out that, this is not basically a history of MHWUN. After painstaking work championed by the union’s National Elders’ Forum for over a decade, the union’s history book was completed last year. The task of this paper is more modest in terms of its historic content. The greater concern is much more about what we can and should do, as THINCF and in our different branches to take MHWUN and the struggle of the working class to the next level towards winning our self-emancipation. It also hopes to elicit perspectives from you, on the issues it puts forward. In the light of the foregoing, the following core sections of the paper are structured thus: an historical background of MHWUN and its tertiary health institutions trade group (THINCF); an exposition of the current state of the union, and; perspectives on taking the ideals and development of the union forward in the tertiary health institutions. The 1976-8 “trade union restructuring exercise” was in many ways a farce. It claimed to be geared at restructuring the trade unions, which numbered about 1,000 and were mainly “house unions”, into industrial unions. But, this was just “story”. In the first place, contrary to that central claim, industry-wide unions were not created, which explains the basis for continued jurisdictional disputes. Secondly, the actual aim of the state was to re-configure the trade unions, in the wake of the Apena Declaration and make the unions more pliant, as a built-in Achilles’ heel of “strong” unions, with more sustainable means of securing membership subscription through automatic check-off dues. The past four decades however show that the state was not quite successful with its “guided democracy” and “limited intervention”. The trade union movement has been a rather dynamic one, providing leadership for working class-people in various struggles. While the post-1989 ideological blues which stunted the pursuit of the ultimate aim of system change as an actuality present even in demands for reforms now might have undermined commitment to some cardinal founding principles of our movement, the overarching aim of the 1976-8 restructuring exercise, which was for the state to incorporate the trade union movement, remains a failure. With particular reference to MHWUN, as well, the restructuring exercise was equally a farce. According to this real myth, MHWUN was “created” in 1978 with the merger of 17 unions, by the fiat of the Registrar of Trade Unions. These unions included house unions such as Uromi Catholic Hospital Workers’ Union and Sacred Heart Hospital General Workers’ Union; regional unions such as Eastern Region Medical Technical Workers’ Union, and several national unions. But the fact of the matter is that, most of the 17 unions were at the time either non-existent or in comatose in some way or the other. And most importantly, almost all the actually existing unions had already willingly expressed their desire to be absorbed into the largest and most vibrant of the 17 unions i.e. the Medical and Health Department Workers’ Union of Nigeria (MHDWUN). MHDWUN was established in 1935 as the Medical and Health Department Workers’ Union of Nigeria and the Cameroons (MHDWUNC). As at the time of the 1978 merger, the total number of members of the 17 unions was 28,019. Of these, there were 23,574 members of MHDWUN, which was 84.1% of the total membership. Thus, we can and do trace the roots of our great union to 1935. MHWDUNC, like many unions formed at that period, was not concerned with just bread and butter issues of wages and working conditions. It challenged the racism inherent in colonialism, being part of a broader movement for the working class’ struggle for self-emancipation from all forms of exploitation and oppression. Not surprisingly, the union and its activists played leading roles in what could be considered as the two sides of the coin of the labour movement i.e. trade unionism and socialist politics. Members of the MHWDUNC were leaders and cadres of the Socialist Workers and Farmers’ Party (SWAFP), in different parts of the country. The union however was equally very consistent in its struggle for improved wages and working conditions without reducing its role as a trade union to one of economism. At the time of the formation and growth of the MHWDUN(C), there were no tertiary health institutions in the country. It was also just a few years before the restructuring exercise that tertiary health (and education) institutions began being generalised, with the establishment of the second generation of universities in the mid-1970s. With the artificial jurisdictional divisions that came out of the restructuring, the Non-Academic Staff Union of Educational, Research and Associated Institutions laid claim to non-academic staffers in teaching and specialist hospitals, as its members. In the early 1980s, apart from its successful reaching out to the workers, MHWUN made several deputations to the Federal Ministry of Labour which concurred that the workers concerned in these institutions, being primarily health workers, should be organised by MHWUN. There were however supporters of NASU in some of these institutions, particularly at the National Orthopaedic Hospital Enugu who insisted, otherwise. NASU went to court on the matter. On August 11, 1986, the court ruled in favour of MHWUN. There were several other legal battles over jurisdiction between both unions regarding organising in the tertiary health sub-sector. But by 2007, under the leadership of Comrade Ayuba Wabba as National President, MHWUN resolved that such a dimension of inter-union relations was not healthy for the trade union movement. It withdrew its subsisting case on jurisdiction with NASU and focussed on organising. The confidence of members and would-be members in a union, it was noted, was of the essence over court rulings on the matter. The confidence of tertiary health members of MHWUN in our great union has been practically forged over the years, with this consultative forum which began here in ABUTH Zaria in 1996, as a central plank of engagement and collective intervention. The forum started as a platform for addressing the peculiar work-related interests of members in this sub-sector of the health system. Four years later, an educational content on topical issues was instituted into the deliberations of the forum. The paper presented in February that year (2000) at JUTH, advanced perspectives on the National Health Insurance Scheme. This was partly a fallout of resolutions reached at the September 1999 National Executive Council meeting held at Makurdi. MHWUN had issued a strike ultimatum for the National Health Insurance Scheme which was still on the drawing board at the time, to be people-centred. While there is obviously a yawning gap between what MHWUN envisaged and what commenced in 2005 as the NHIS, the union’s intervention, which was enriched by the February consultative forum discussion and vigorously canvassed with the state, helped to blunt the sharper edges of the questionable format of a National Health Insurance Scheme in Nigeria. The leadership elected by the 7th National Delegates Conference in December 2004, with Comrade Ayuba P. Wabba as National President, took significant steps towards integrating the trade group into the mainstream structures of the union. First, the Chair of the Forum was co-opted into the Central Working Committee in February 2005. Second, at the Special (Constitution Review) National Delegates Conference convened in November 2007, the CWC proposed that the Chair of the forum be made a National Vice-President. This was ratified by the Conference-in-session. 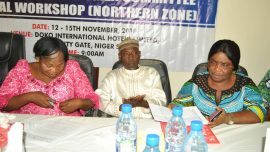 The Tertiary Health Institutions National Consultative Forum was also adopted as the official nomenclature of the trade group. The process of integration was not just for an “oga at the top”. Active involvement of the members of the union from the trade group in activities and decision-making structures and processes of the State Councils was equally promoted. With this, a strong sense of camaraderie has been forged between members of MHWUN across the work barriers of the tertiary, secondary and primary sub-sectors of the health system. MHWUN as a whole and THINCF as a trade group of the union have both taken great leaps and bounds in moving forward over the last decade. A major reason for this has been leadership. Both have witnessed not just their longest-serving leaderships, but clearly the most visionary and dynamic as well. And these were reformers who ensured that the spirit of their far-reaching efforts percolated down to the rank and file. The challenge of consolidation thus faces the current leaderships at both levels. We are however rest assured that this would be met for two reasons. First, those in leadership now equally have sterling track records of being vibrant change-agents. Second, the ranks of the union in general and this trade group in particular have been sensitized to expect no less. And while they would give full support to advancement, they would not accept anything outside such. MHWUN today is reputed as one of the most self-sustaining unions in the country. From being in debt up to the tune of N46m as at December 2004, and finding it difficult to pay staff as at when due, the union now has assets running into billions of naira and several hundreds of millions of naira in fixed deposits. The union also has a magnificent national secretariat complex, the Ayuba Wabba House. Similarly, several tertiary hospitals’ branches now have their own secretariats. 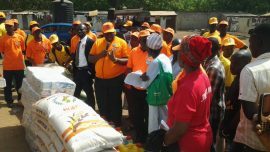 A number of these were built by the branch executives, while others were secured from the managements of the health facilities. Irrespective of how branch secretariats were gotten, as a rule, they have been equipped as had never been done before, including with the provision of access to new communication technologies. But, the greatest asset of MHWUN and THINCF are not these material, tangible goods, important as they are. They are in the entrenched processes which have resulted in expansion of membership and deepening of members’ knowledge and understanding on working class’ issues. The membership of MHWUN has grown by some 1000% since it was deemed to have been formed in 1978. A significant proportion of the over a quarter of a million members of the union today, were organised over the last ten years. Membership increases in tertiary institutions contributed to this. The union (in conjunction with sister JOHESU unions) also won significant wage increments for members with the establishment of the Consolidated Health Salary Structure (CONHESS), six years back. Before the harmonisation of public sector salaries in 1998, workers in the health sector had a better pay package (than civil servants) with the Health Salary Structure (HSS). CONHESS is thus a reclaiming of the high grounds, in terms of wages, that health workers hitherto enjoyed. Education and training is also a key area where MHWUN and the THINCF trade group have built upon, in recent times. Subsequent to the ratification of an Education Policy by the 7th National Delegates Conference and the streamlining of a class-based approach to education and training by the 2006 Strategic Review and Planning Conferences, MHWUN has emerged as one of the unions with the most robust educational activities in the country. Gender mainstreaming has been a major focus of MHWUN. The union is a pace-setter in this direction, being the first union to organise a National Gender Conference and to have a democratically-elected National Women Commission. We have since then organised four National Women Conferences and all the State Councils and several branches have virile women committees. MHWUN was also the first union to adopt a Gender Policy. This was equally at the 7th National Delegates Conference in 2004. Constitutional measures have been taken to further gender mainstreaming. The Chairperson of the NWC is automatically a National Vice President, just as the Chair of THINCF and Chairpersons of the States’ Women Committees are automatically State Vice Chairs. Gender mainstreaming goes beyond just top leadership of the women structures. Education and training for women’s capacity-building has been given a pride of place. The National Women Leadership Development Workshops series has come to be the first set of educational activities of MHWUN every year, run for two weeks in the month of January. State Councils have equally been directed to step this process down. A number of states have heeded this directive and action is being taken to ensure that this is generalised, as resolved. Affirmative action is also encouraged during State Council and Local Branch elections. This is primarily in the form of the guidelines issued by the National Secretariat. This has led to the broadening of women’s presence in the union’s decision-making structures, though a lot more has to be done. The youth are the future and the future starts now. This is why MHWUN has placed great premium on mainstreaming youth. 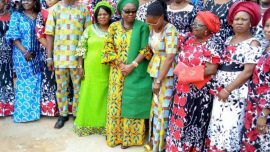 As with gender mainstreaming, the union has also blazed the trail in Nigeria, in this regard. We became the first union to organise a National Youth Conference where a democratically-elected National Youth Committee emerged in 2012. The 9th National Delegates Conference, a year ago also passed a Youth Resolution and the 2nd National Youth Conference will be organised this year, enriching the efforts of MHWUN at organising young workers in an inclusive manner. Towards raising both the professional awareness and class consciousness of members, MHWUN occasionally circulates posters and flyers on topical working class and health issues. The Health Worker being MHWUN’s flagship publication has also been an avenue for furthering discourse within the union, with contributions by members and rich news and features stories. While this has not been issued as at when due in recent times, there are efforts at getting it back on track. It is not only the traditional media that is now being utilised by MHWUN for the dissemination of information and sensitisation of both its membership and its publics. We have made the turn to inclusion of new communication technologies. For example, the union’s website www.mhwun.org is probably the most regularly updated of any trade union in the country and we intend to do even more with it soon. We also have a Facebook page and regularly update branches and State Councils through emails. As a union of health workers, MHWUN has taken issues of healthcare delivery, particularly for working class-people, with all the seriousness these deserve. While we have a rich history of policy engagement which resulted in major improvements in the formulation of the NHIS and the establishment of Primary Health Care Boards in states (about 2 decades after we commenced agitation for this), intervention in policy and law-making processes and healthcare practice has been taken with greater vigour in recent times. The two most visible examples of this are our role in ensuring a reformulation of the National Health Bill before it was passed as the current National Health Act and our role in the National Ebola Response. While we were not as successful as we aimed for in the health bill’s reformulation, we did win a partial victory in promoting an inclusive approach to public health care delivery. Regarding the EVD response, our role has been commended at home and from far and wide. MHWUN actually was at the fore of calling for crisis preparedness before the dreaded disease came calling on the shores of Nigeria in July 2014. And immediately after that moment, we organised a series of conferences to prompt selfless action on the part of MHWUN members. MHWUN also published and massively circulated the WHO Guidelines for handling the disease and several posters and flyers. A major achievement of MHWUN which cannot be separated from the dynamics of THINCF is the union’s leading role in the emergence, growth and development of the Joint Health Sector Unions (JOHESU). This united front of five unions, which collectively represent nine tenths of the health sector’s workforce has been a rallying platform for the defence of our interests. MHWUN has chaired the national JOHESU since its formation, being at the fore of its leadership in terms of both material sustenance and ideological stance. JOHESU branches have subsequently evolved from what used to be Joint Action Committees (JAC) in State Councils and particularly tertiary health institutions branches. The largest possible spectrum of unity is of the essence for the working class to win its self-emancipation and even to secure lasting reforms in the here and now. This is why MHWUN’s commitment to the broader working class goes beyond our primary sector i.e. the health sector. This is the inspiration for our role in the Nigeria Labour Congress, where we stand tall as the only union to have produced two Presidents of Congress. Equally, as a result of the rich traditions of MHWUN, it provided leadership to Congress when a “new beginning” had to be midwifed after the dark days of military dictatorship in 1998/1999. The working class is an international movement. MHWUN’s quest to forge unity in action could thus not be limited to the national sphere and has never been so. In the 20th century, before the collapse of the USSR, our international work had been hinged more on relationships with the East bloc and Cuba. In recent times, we have been much more involved in the Public Services International (PSI) and the building of the West African Health Sector Unions’ Network (WAHSUN) which is the pioneering sectoral network of PSI affiliates on the African continent. THINCF as a trade group and MHWUN branches in the tertiary health institutions have of course been part and parcel of the recent history of MHWUN as shown above. Thus, talking of taking the new MHWUN spirit forward in this sub-sector is more about consolidation, particularly in the branches. Building membership and check-off dues remittances: material sustenance is necessary for the continued sustainability and independence of a trade union. It is however regrettable that there are gaps in the extent to which this appears to be appreciated within the ranks of THINCF. Despite the fact that expenditure on industrial relations issues by the National Secretariat is more skewed towards the interests of this trade group as a result of the Federal Government being the major employer of workers in the tertiary health institutions, and the fact that the percentage share of check-off dues for branches is higher for this sub0sector, there are reasons to believe that leakages in check-off dues remittances are prevalent. This has been curbed to a great extent with the introduction of the IPPS. But there is still a large room for improvement which we would urge the tertiary institutions branches leaderships to courageously and sincerely address. Education and training: consciousness and organisation are the two primary weapons of the working class in its struggle for a better world and the betterment of working people. For genuine trade unions, ceaseless and consistent class-based education is of the essence. Leaders and rank and file members must be clear-headed on topical contemporary and historical issues of concern to us as workers. At the national level of THINCF, this has been largely instituted. But at the level of the branches, very few organise education and training activities, regularly. This is largely because it is seen as expensive. But it does not necessarily have to be so. While it might be good to have sessions for some members in institutes such as the Michael Imoudu Institute for Labour Studies (MINILS) as some branches have done over the years, we could and should organise open, mass educational sessions for members at least once every two months. Internal democracy and vibrant branch life: as stated above, organisation and consciousness are critical for trade unionism. The branch is the primary unit of our union. It is thus the most important theatre for today’s organisation in itself, and for building tomorrow’s organisation through the training and imbibing of a vibrant trade union life in tomorrow’s shop stewards, and principal officers at the state council and national levels. Essentially, this requires our organising branch general meetings as and when due. Constitutionally, branch general meetings are to be organised at least once every two months. But, few branch executives (and this is not just with the tertiary institutions, we are addressing this) have lived up to the fulfilment of this constitutional provision. The open mass educational sessions earlier proposed could be built into the general meetings the way educational sessions of THINCF at the national level has been built into the regular Consultative Forum sessions. Furthering communication in the ranks of membership: any and every means of disseminating information and fostering communication within the ranks of membership should be utilised. Both traditional and new media should be utilised for this. Most of the branches in this sub-sector have information boards. But there is the need to go beyond this to the issuance of bulletins/flyers, production of posters, creation of WhatsApp groups etc. Creatively organising and fighting casualization: the tertiary health institutions have been a major arena of the struggle over the implementation of neoliberal policies by the state. We have been able to curtail some of the worst intent of the bosses. But they have been successful in implementing casualization to different extents. There is the need to build our membership base, both within permanent staffers and contingent staff. This would require creativity in some form or the other, as NUPENGASSAN for example did in organising casual workers within the oil and gas sector. But, it will be essential for us to move from the defensive to a counter-offensive against privatisation and other neoliberal policies, in the health sector. Building JOHESU & labour-civil society relations: it goes without saying that our branches must continue to play leading roles in JOHESU. While this does not necessarily mean having to be the Chair of every JOHESU branch, with our having the largest numbers and most variegated cadres within the folds of JOHESU in every hospital, and our providing the national leadership, there is a huge responsibility on our shoulders to ensure that JOHESU gets stronger at the roots. This would entail building activities for local JOHESU structures even when there are no immediate demands being struggled for and establishing robust relations with the broader civil society movement. Active participation in the State Councils: it is a great thing that tertiary health institutions branches have now been fully integrated within the State Councils. The trade group is not a body onto itself, distinct from the structures of the union. All members, irrespective of their sub-sector have a singular commitment to the ideals and organisation of MHWUN. Tertiary health institutions’ branches thus have to continue to work more assiduously as part of the State Executive Council, as a team, within the States Councils. Mainstreaming gender and youth: the tertiary health institutions should equally take up the gauntlet of furthering the union’s trailblazing commitments to mainstreaming gender and youth. There is no reason why any tertiary institution branch should not have a branch women committee. Many do have presently, but those that are yet to constitute such, should do so democratically as soon as possible. Similarly, all efforts should be put into mentoring and mainstreaming youth at the branches. This is closely related to, even if distinct from the need for a vibrant union life in the branches. Young workers with the spirit of activism could be more easily discovered and helped to grow to the utmost of their potentials, where and when there is a vibrant union life in a branch. This paper was written with a realisation that there are significant shifts taking place within the ranks of THINCF (and indeed the union as a whole). What could approximate to a generational change is gradually, but assuredly taking place, as old tested and trusted hands in the branches move on to the national level in THINCF and to positions of responsibility within the States Councils, and even the national leadership of our great union. This is thus an opportune time for us to reflect on where we are coming from, taking note of what we have done well in our rich history, and challenges that still abound in our ranks, towards our taking action with the intent of consolidating the building of the 21st Century MHWUN as a strong, dependable and class-focussed union of workers. As we can see, a lot has been done, but a lot more remains to be done. The last section before this conclusion focussed more on the tertiary institutions branches, because that is where we are based and thus where we can and must take immediate action. At the larger sphere of the union as a whole, MHWUN will be organising a National Leadership Retreat in April to come up with a 3-year programme of action aimed at the Consolidation, Advancement & Progress (CAP) of MHWUN. This process-driven retreat is not an up-bottom programme. Without the national leadership’s dereliction of its responsibility to provide overarching leadership, our amiable National President Comrade Biobelemoye Joy Josiah and the CWC have upheld the position of building solidly on our union’s sterling track records, from below. Thus, we do not intend to talk to you, but for us to talk together and walk together, for the tasks ahead require the brains, hearts and limbs of each and every one of us. Thus, we would appreciate inputs from THINCF at this meeting in terms of propositions to the forthcoming retreat. 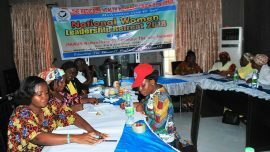 During the 2016 series of the National Women Leadership Development Workshops, which brought together about 270 leading women in the union, for example, resolutions were reached and have been presented as inputs from them to the Retreat. It is our belief that, by the next THINCF meeting, we would have taken decisive steps in moving forward, building on where we are and where we are coming from. United and determined, even the sky cannot be a limit to us. This is the time for us to rethink, reflect and act. Let us seize the moment. Viva International Working Class Movement!!!! *Being a presentation by Comrade Baba Aye, Deputy Secretary General/Head, Education, Planning, Research & Statistics Dept., MHWUN at the MHWUN Tertiary Health Institutions Consultative Forum session held on February 23-25, 2016, at the Ahmadu Bello University Teaching Hospital, Zaria.